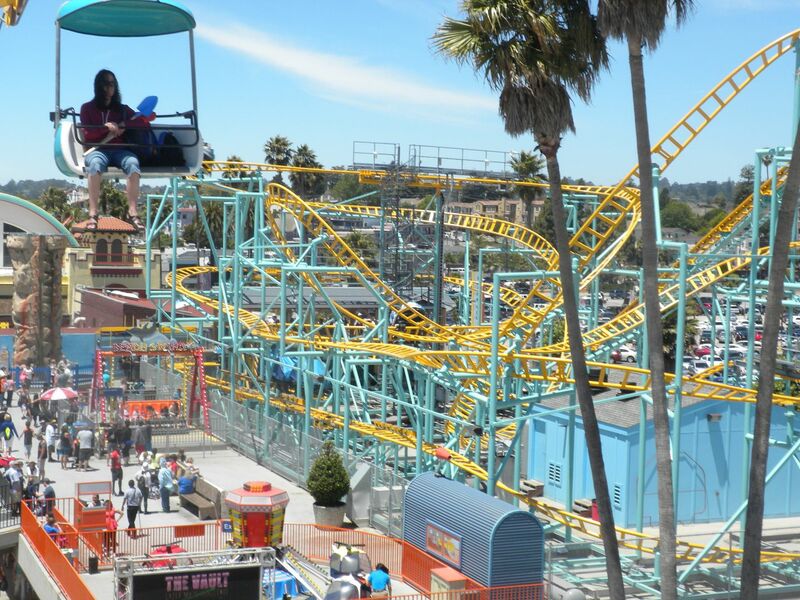 On Thursday, June 19 Coaster Con XXXVII moved to Santa Cruz Beach Boardwalk. 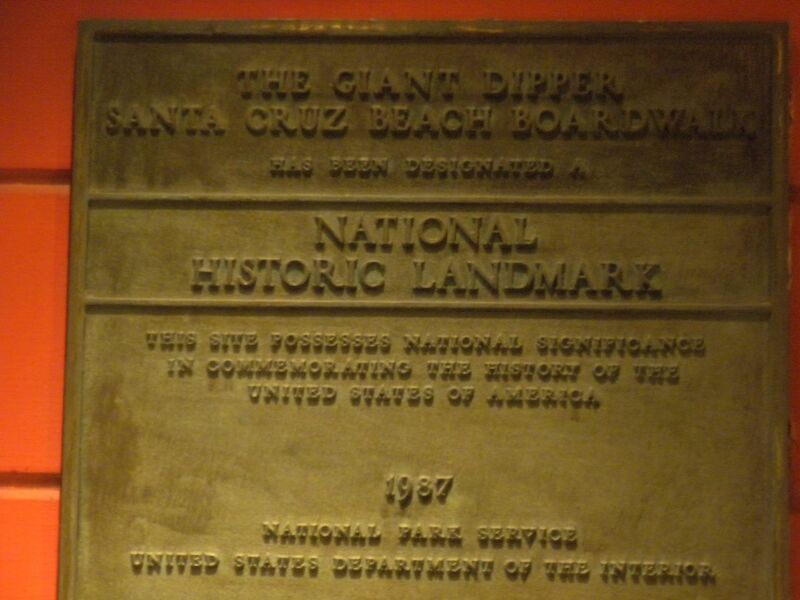 I was looking forward to returning to this park as my visit in 2006 was somewhat short. 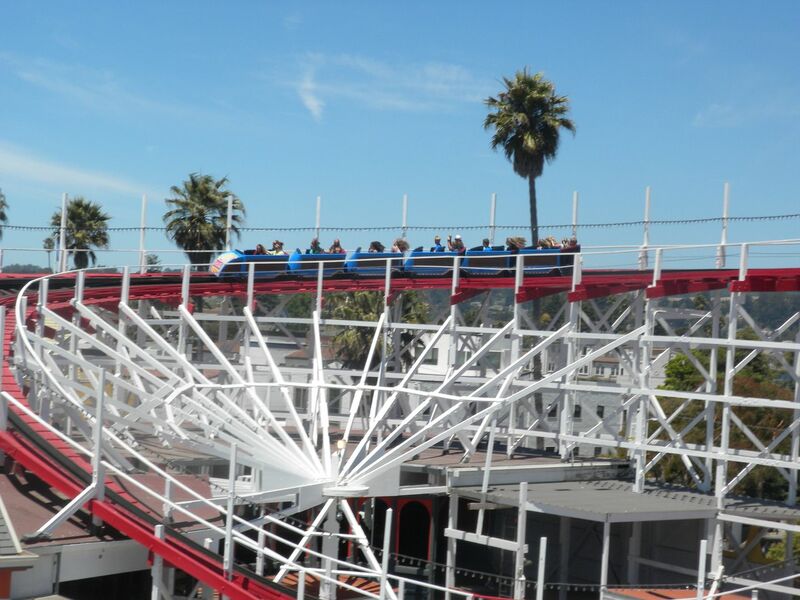 Perhaps the best seaside amusement park for a number of reasons, this quintessential piece of Americana has been lovingly preserved. 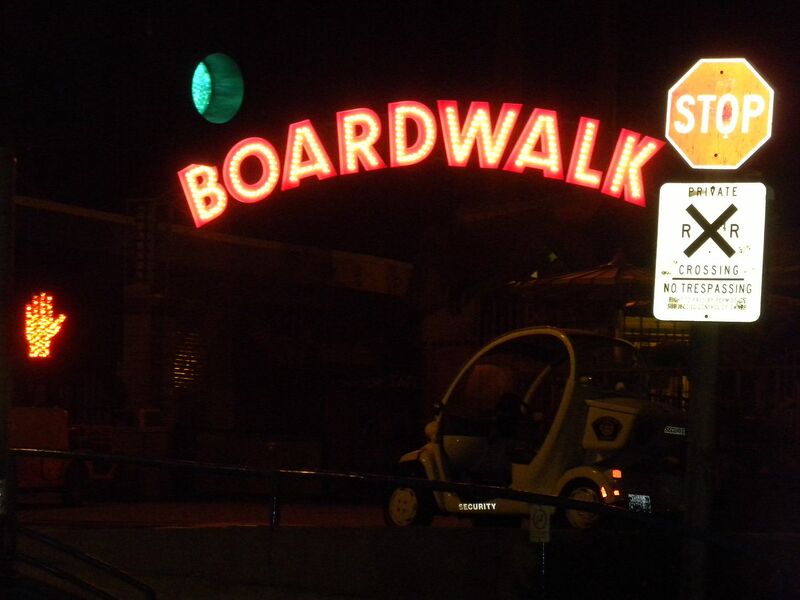 from its plethora of dark rides to its kitschy Boardwalk foods, from its beachside views to its well preserved Cocoanut Ballroom, few seaside parks have the total package that this park does. 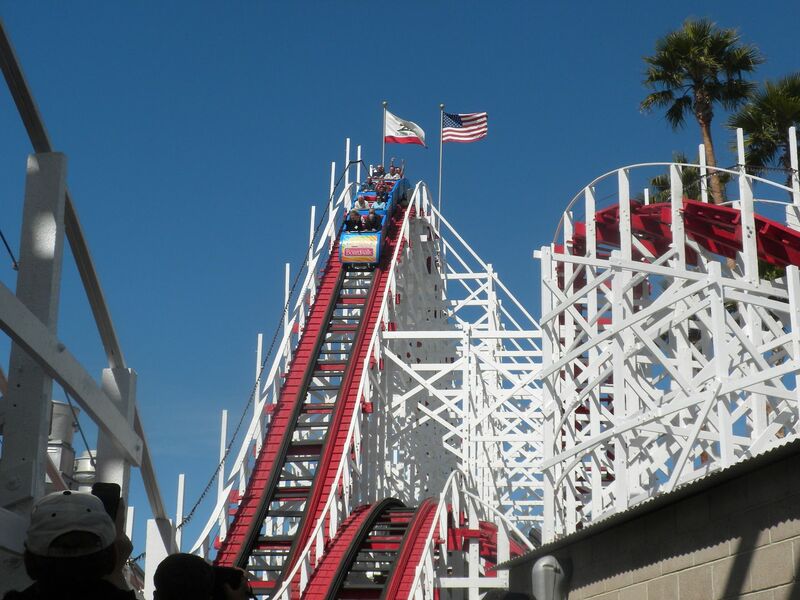 This is one of the great classic coasters that is still around, and it was giving good rides. that delivers airtime and laterals throughout its course. 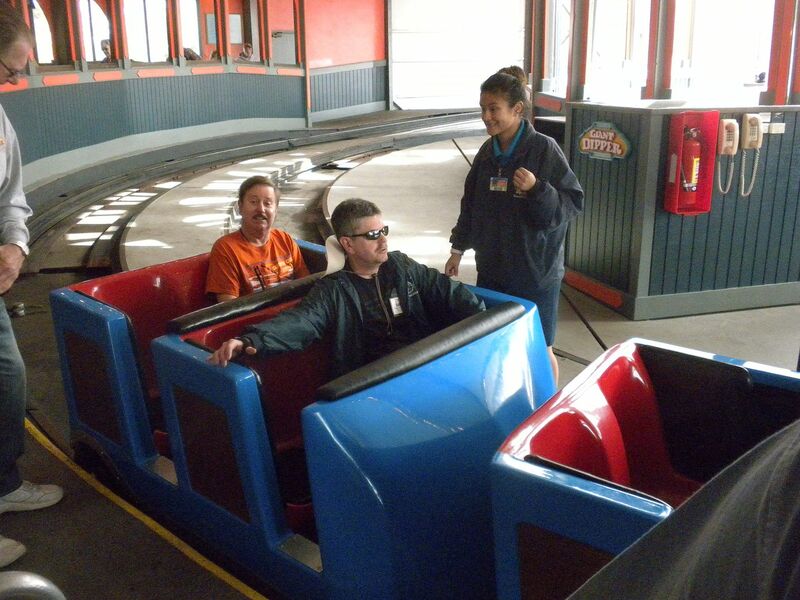 this spinning coaster gives a good ride – 2 rides, 1 during ERT. Gave a good ride – 1 ride during ERT. 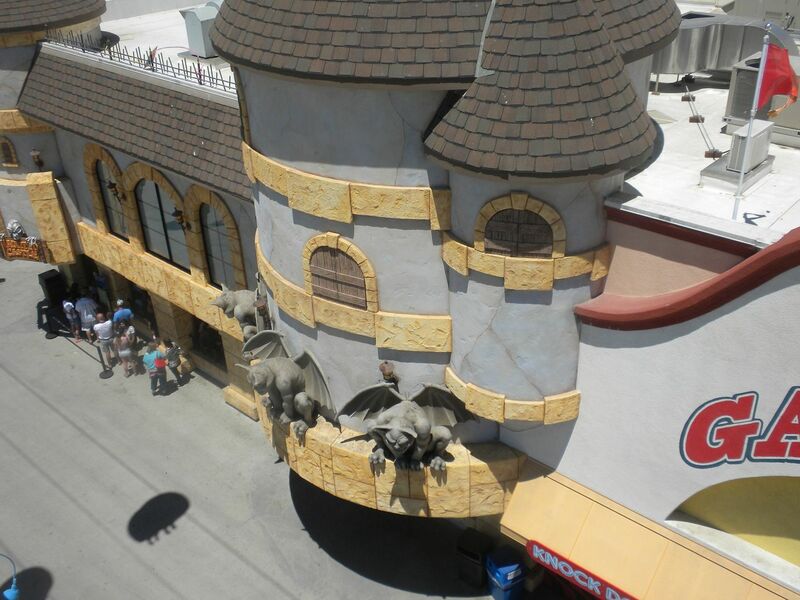 Haunted Castle: Redone since my last visit, this excellent darkride begins with a circular lift down below the Boardwalk. 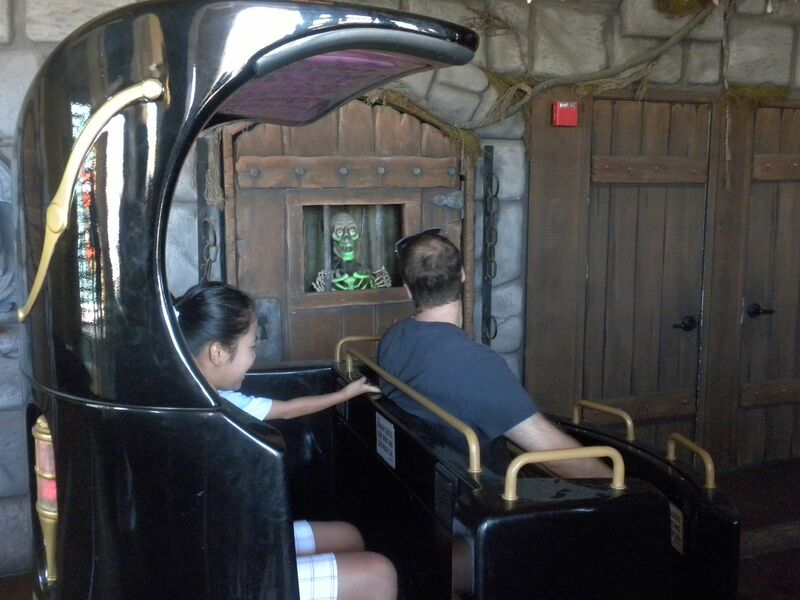 The effects are excellent, one of the best darkrides I have seen outside of Disney – 3 rides, 1 during ERT. 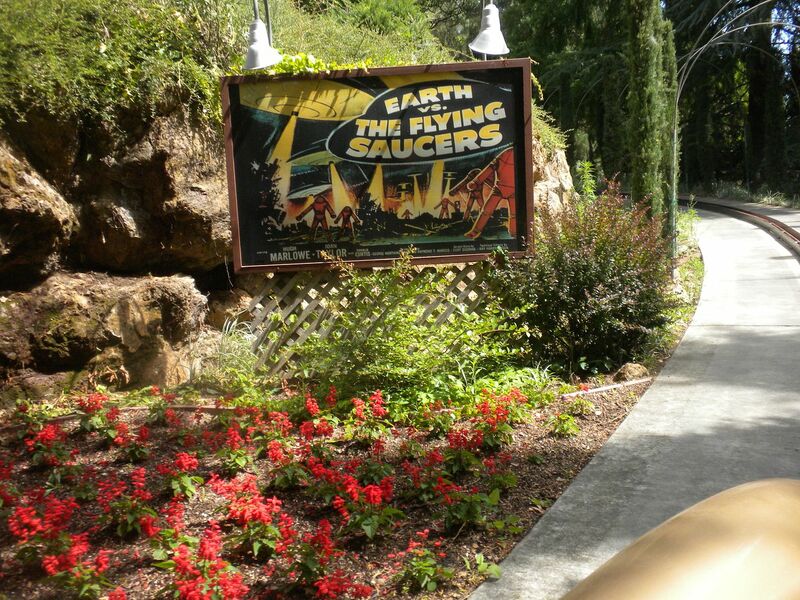 This nicely done darkride from 1961 takes riders on a long journey through the home of the parks cavemen, and even includes a working roller coaster – 2 rides, 1 during ERT. 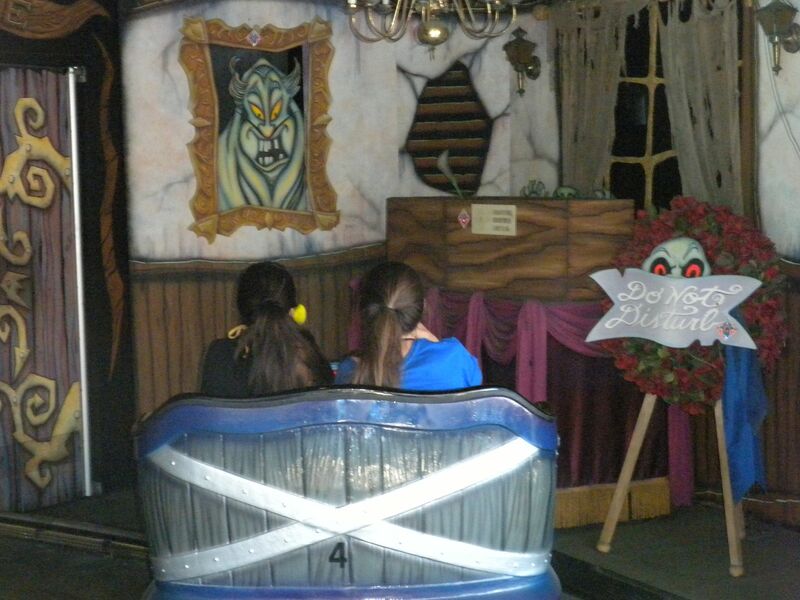 Ghost Blasters: This Sally interactive darkride is fun – 1 ride. Fright Walk: A pay-extra attraction, this walkhrough haunted house in the park’s former funhouse is good and worth the nominal cost – 1 walkthrough. 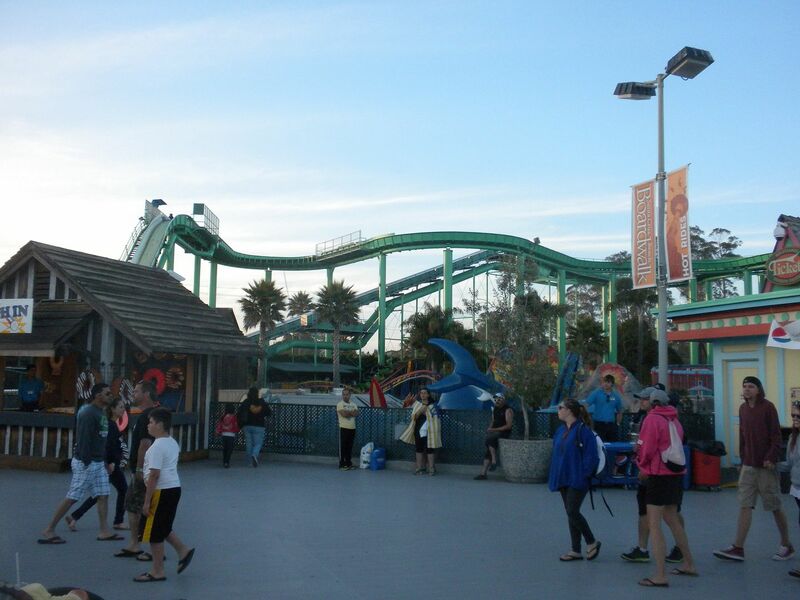 Double Shot: This launch/drop tower has great ocean views – 1 ride. 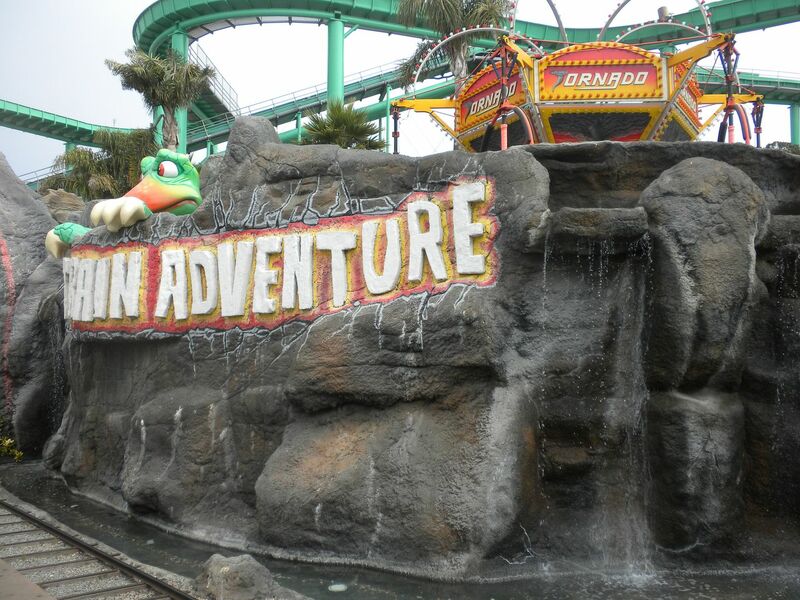 Logger’s Revenge: This flume has great ocean views, good drops and got me fairly wet–1 ride. 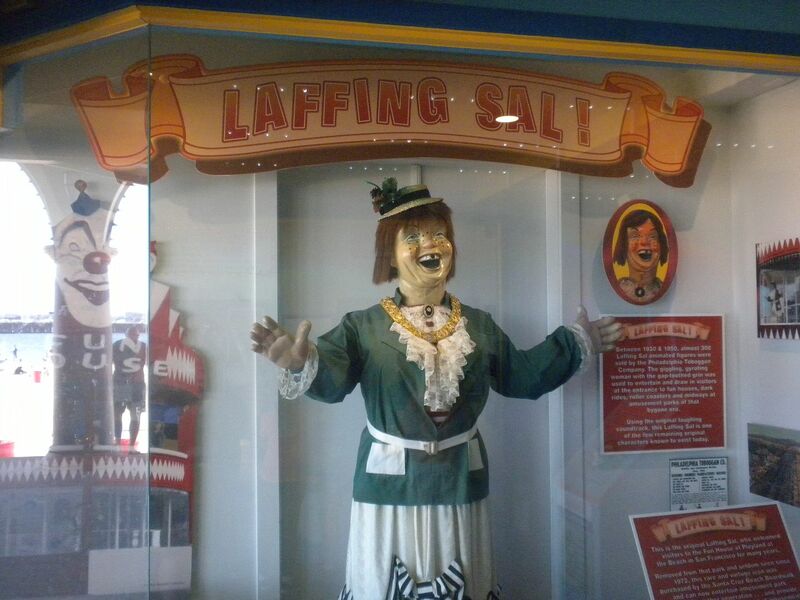 This National Historic Landmark has a working ring machine, which is a lot of fun. 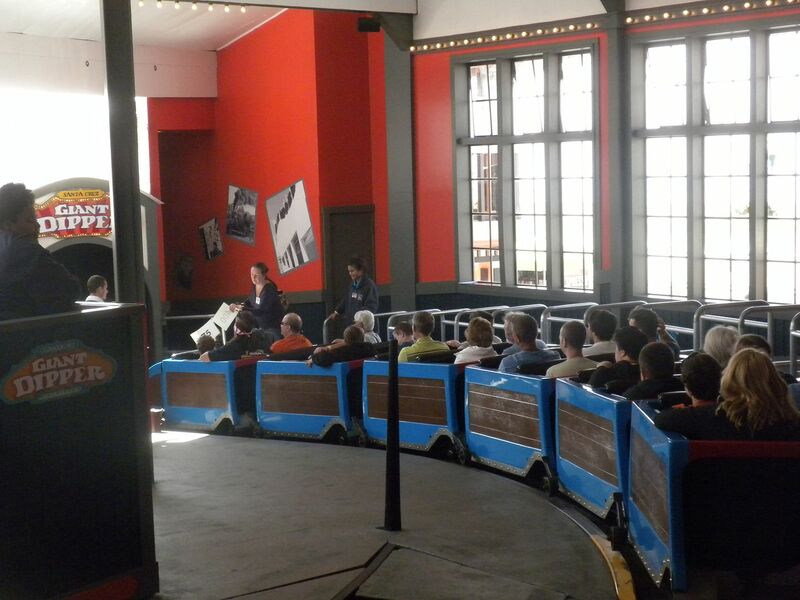 It also has 3 classic organs which interact with each other – 4 rides, 2 during ERT. 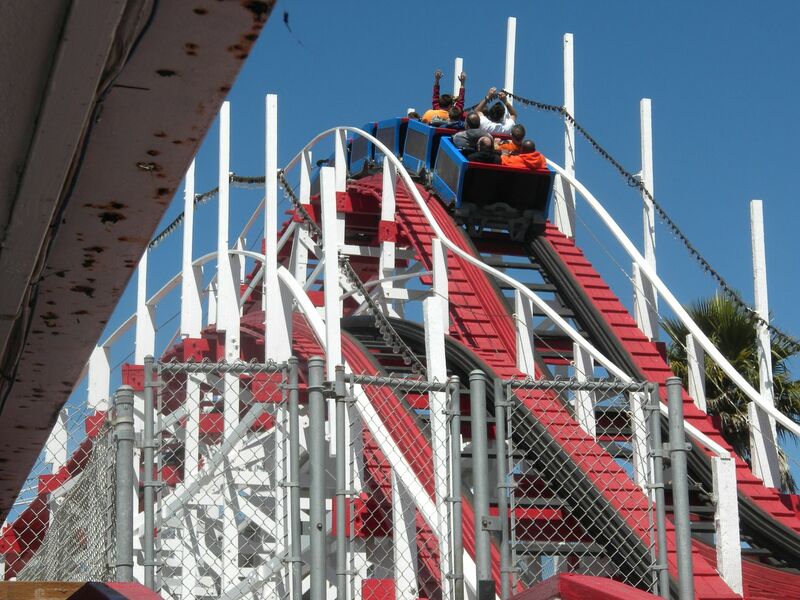 Fireball: This pendulum has great forces – 3 rides, 1 during ERT. WipeOut: This indoor Breakdance gives a good ride; flats are always better indoors – 1 ride. Cliff Hanger: This Kite Flyer gave a good ride – 1 ride. Tsunami: This Music Express was good – 1 ride. This is my favorite Evenly Aircraft ride, and it was a lot of fun – 1 ride. Pirate Ship: Good ride – 1 ride. 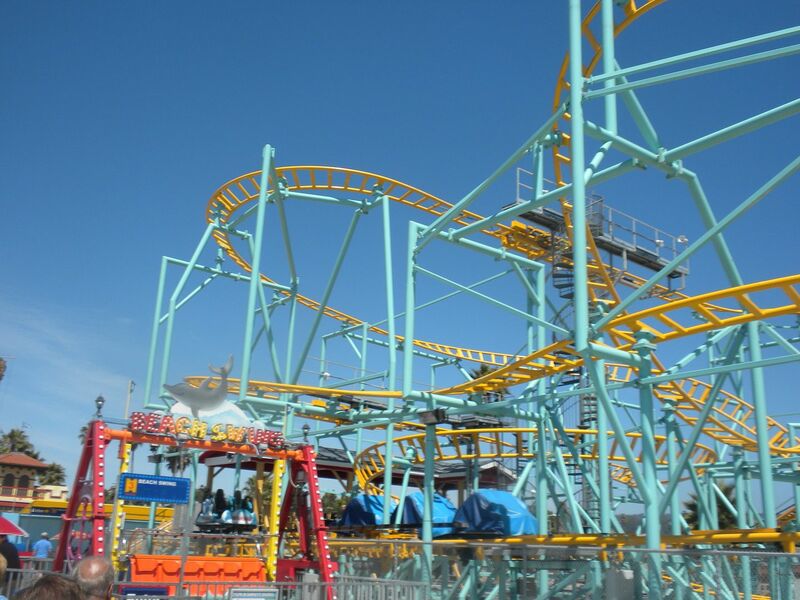 Tornado: Good spinning – 1 ride. Sea Swings: Good ride – 1 ride during ERT. 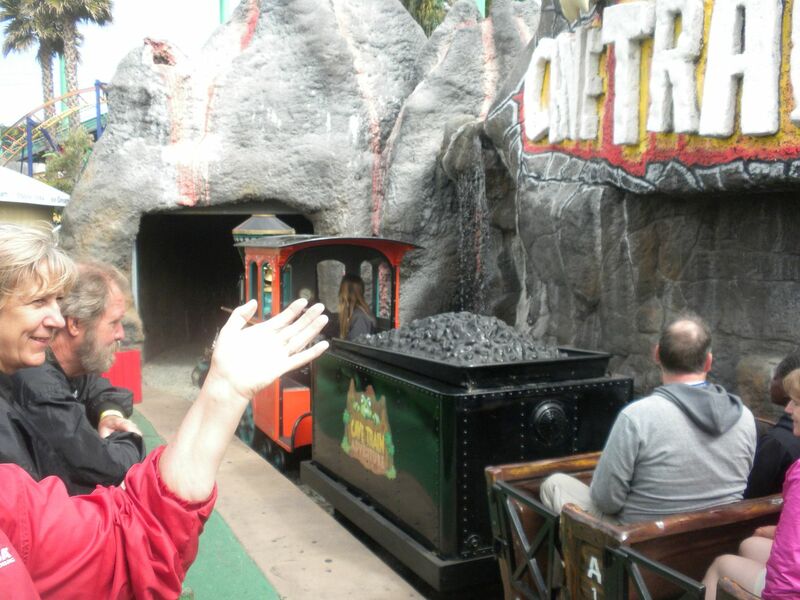 Rock & Roll: This Himalaya ride was good – 1 ride. 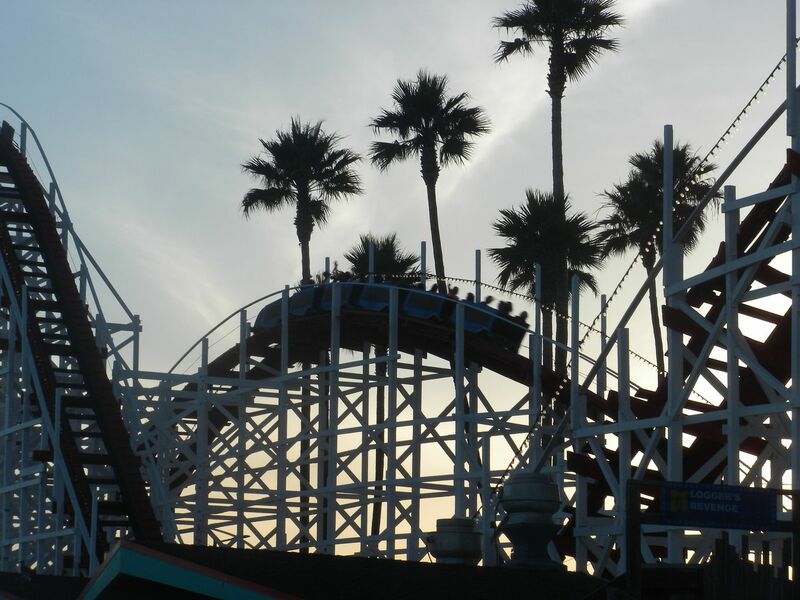 Cyclone: This Roundup had riders who wouldn’t obey the rules and had to be kicked off, causing us to have too long of a cycle – 1 ride. 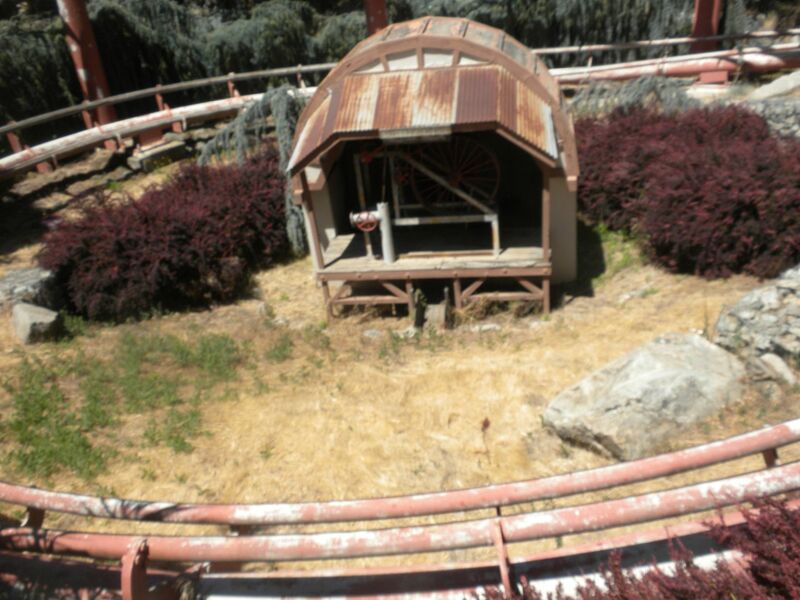 Ferris Wheel: Good views on this Eli Bridge wheel – 1 ride. 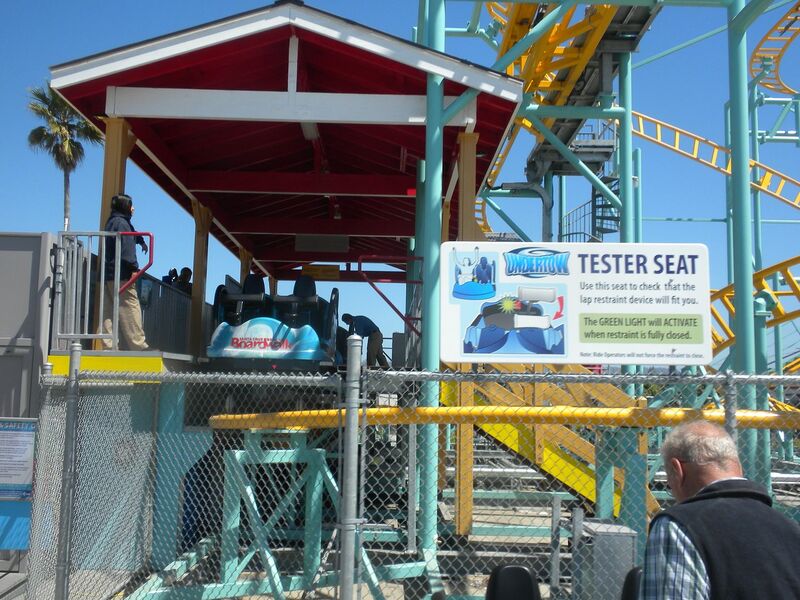 Riptide: Our Tilt-A-Whirl car didn’t turn well, never completing a full cycle – 1 ride. 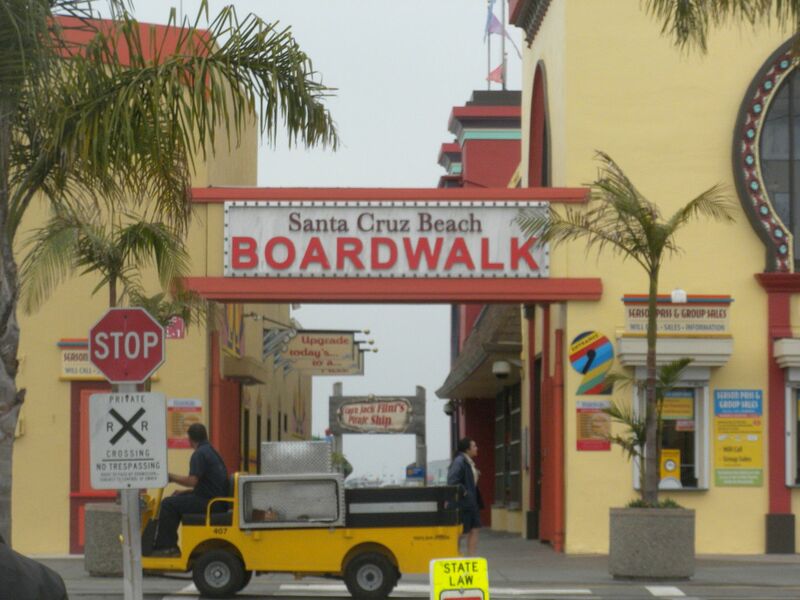 Crazy Surf, a Rainbow type ride was not operating. 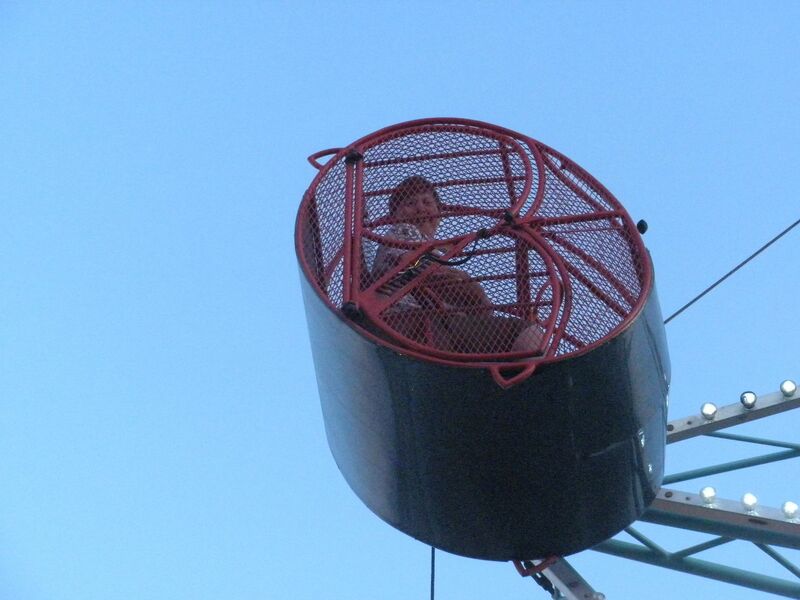 Sky Glider: This ski lift style skyride is a great way to travel down the Boardwalk – 3 rides. 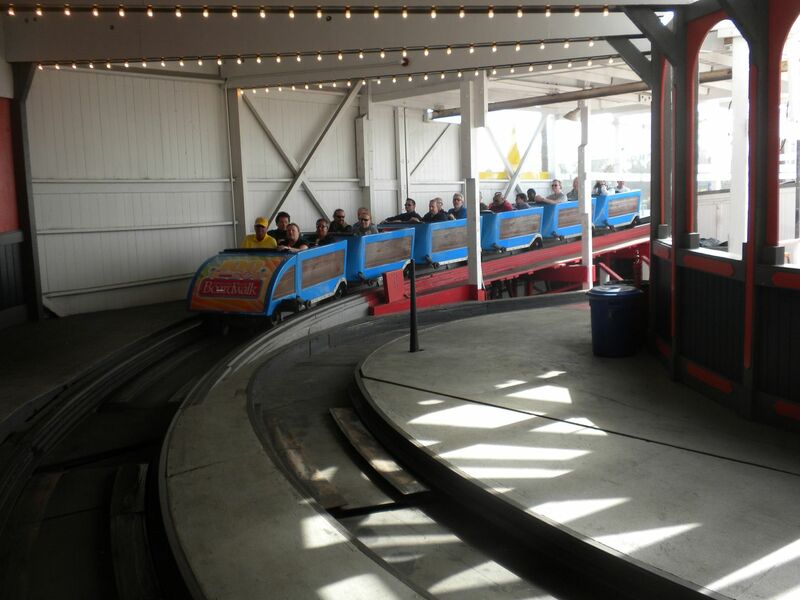 Speed Bumps: Fairly good bumper cars – 1 ride. 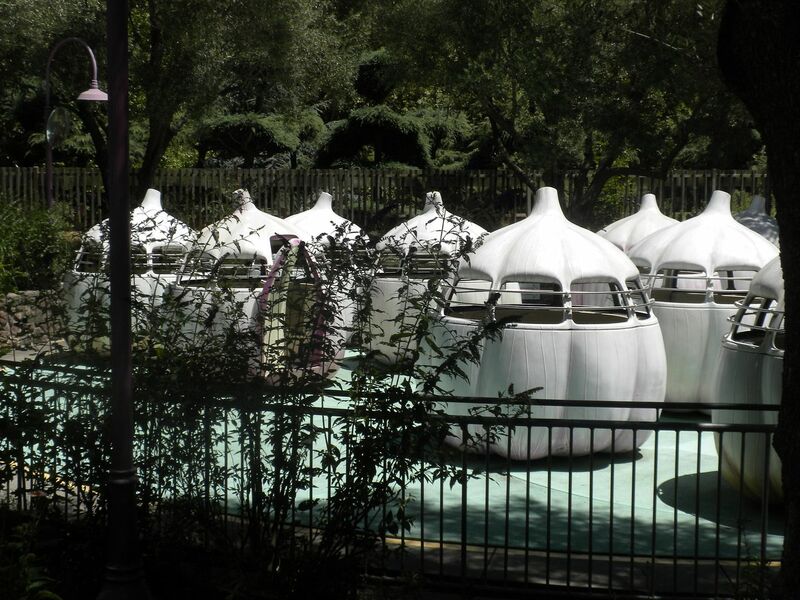 Space Race: These round seat bumper cars were good – 1 ride. 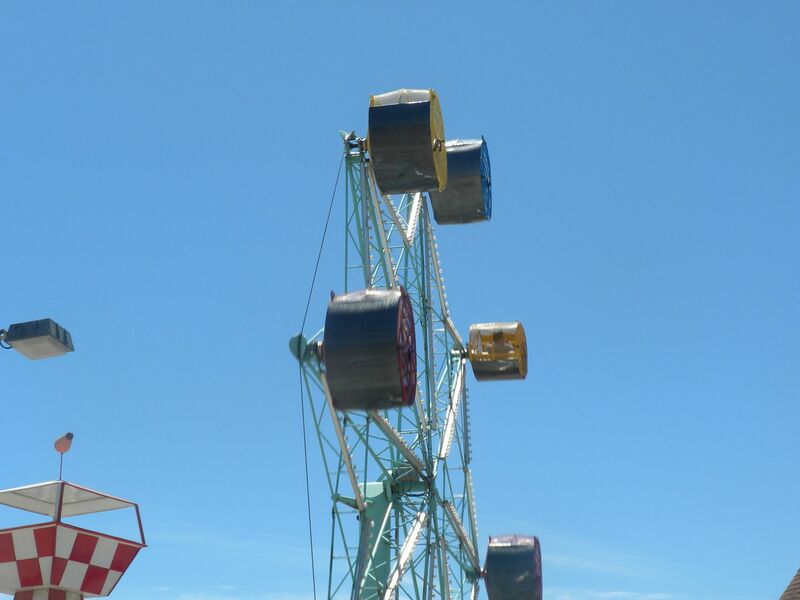 Kiddie rides include: Freefall, a family drop tower; Bulgy the Whale; Jet Copters; Rugged Buggies; Red Baron; Speed Boats; Speedway; Convoy; and Sea Dragons. The park provided us with a breakfast when we arrived and a delicious meal in the Cocoanut Grove Ballroom that evening that included ribs and chicken. 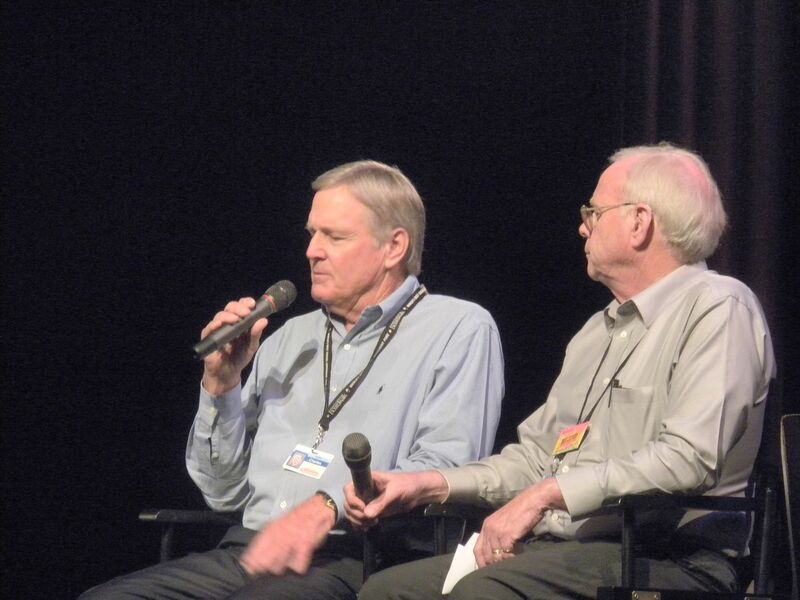 They had a nice Presentation with management and discussed the history of the park. The provided us with a special pin commemorating the event and provided 2 sessions of ERT. 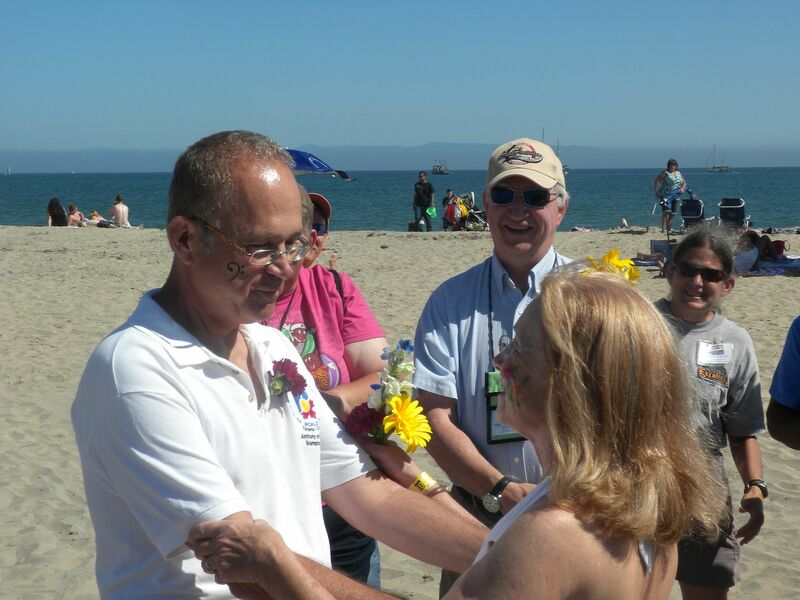 Also that afternoon 2 ACE members, Michael and Celia Horwood renewed their wedding vows in a ceremony on the beach performed by ACE member Rev. 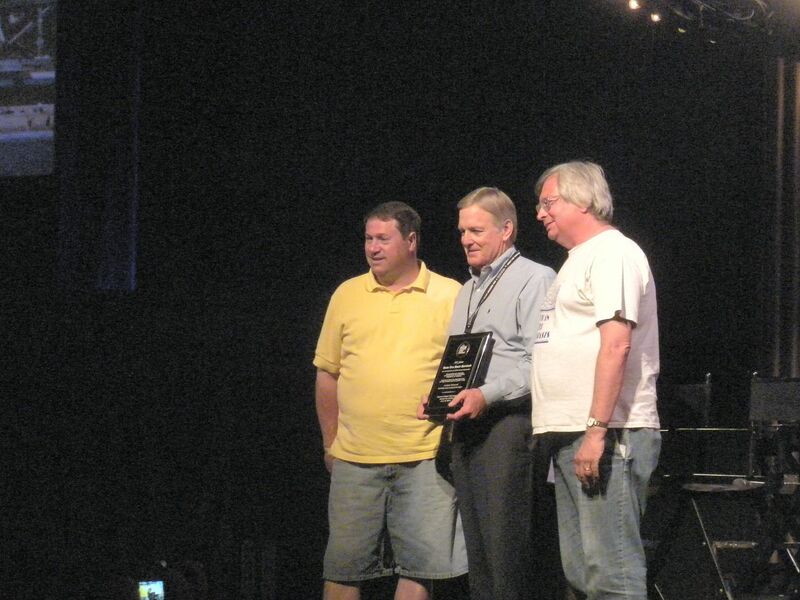 Cliff Herring. 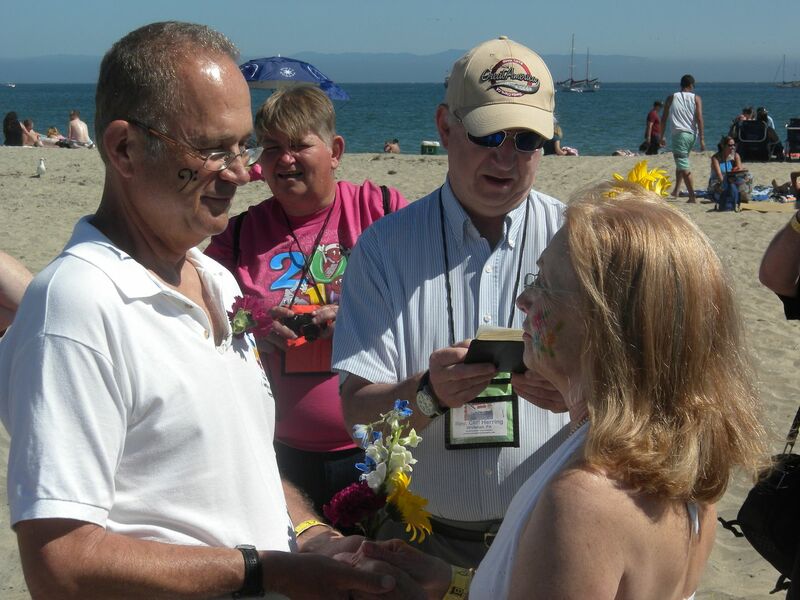 As I listened to their heartfelt vows to each other before God, and to the words of Rev. Cliff, it was touching to think about while we share this fun hobby together there are things that are more important and more lasting in our lives, and we can share those things together as well. While I would have liked to have had a little more time to explore this park, it was a great day and I look forward to future visits. We returned to the hotel to prepare for the last day of Con. 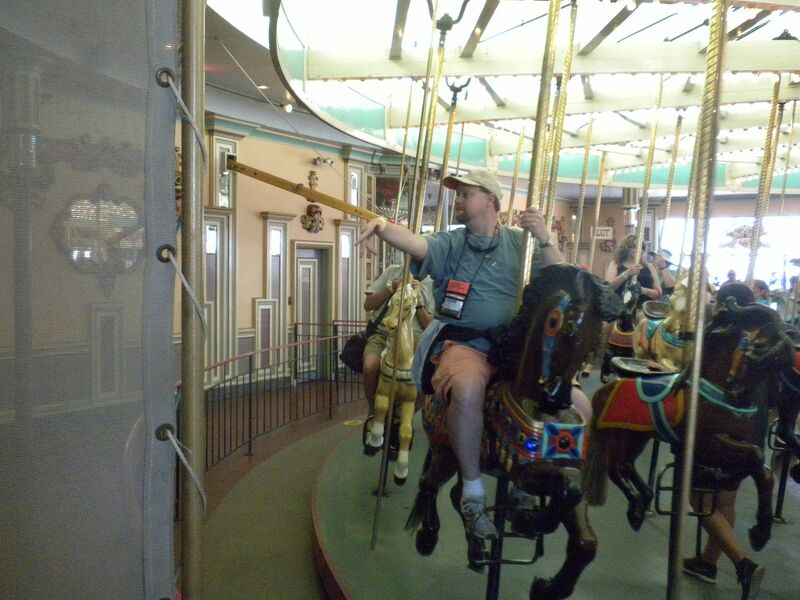 On Friday, June 20 Coaster Con XXXVII would come to an end, but not before going to one last park. 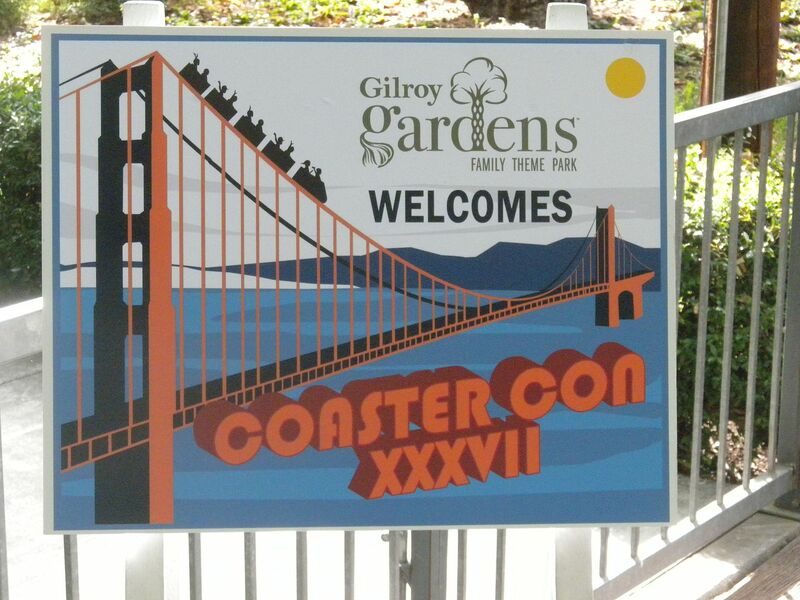 We arrived at Gilroy Gardens in Gilroy, CA that morning for an ERT session before the park opened. When I last visited this park in 2006 it was known as Bonfonte Gardens. 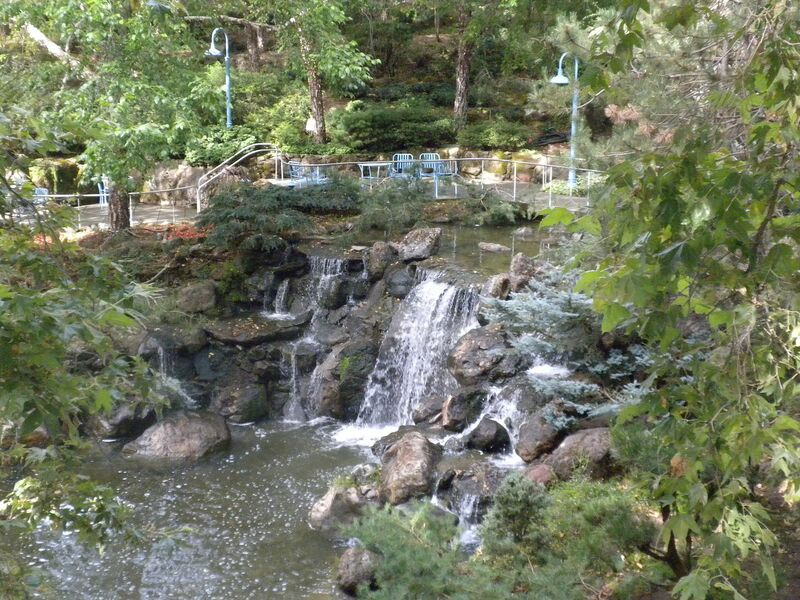 Built by former Nob Hill Foods owner Michael Bonfonte, the park was originally a place for his employees to enjoy, but eventually it was opened to the public. 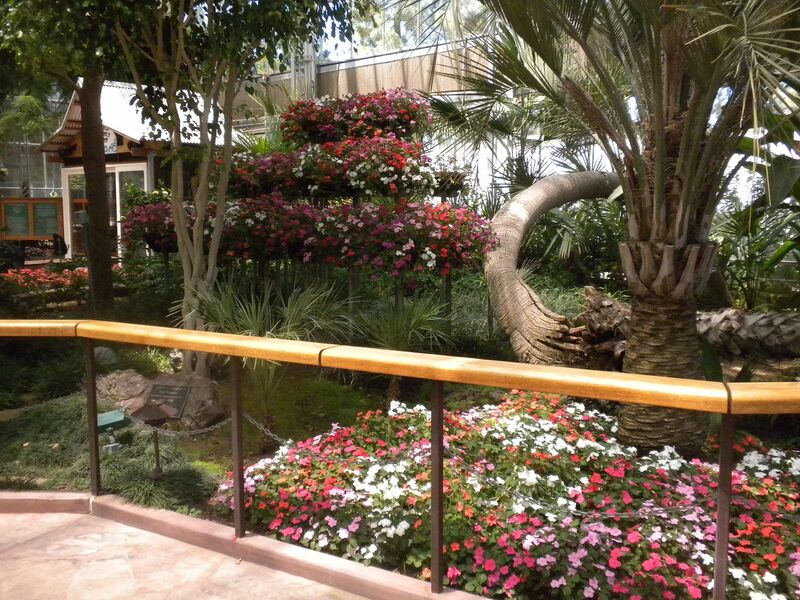 While its rides are geared to children, it also maintains some beautiful gardens. 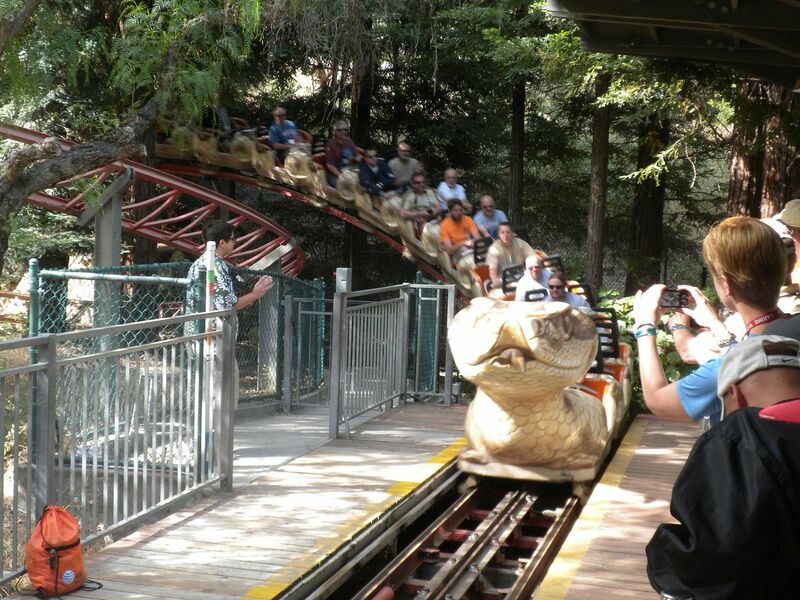 Quicksilver Express Mine Coaster: (Morgan, Mine Train, 2001) This coaster is Morgan’s brief entry into the mine train market, but they should have built more as it is very good. 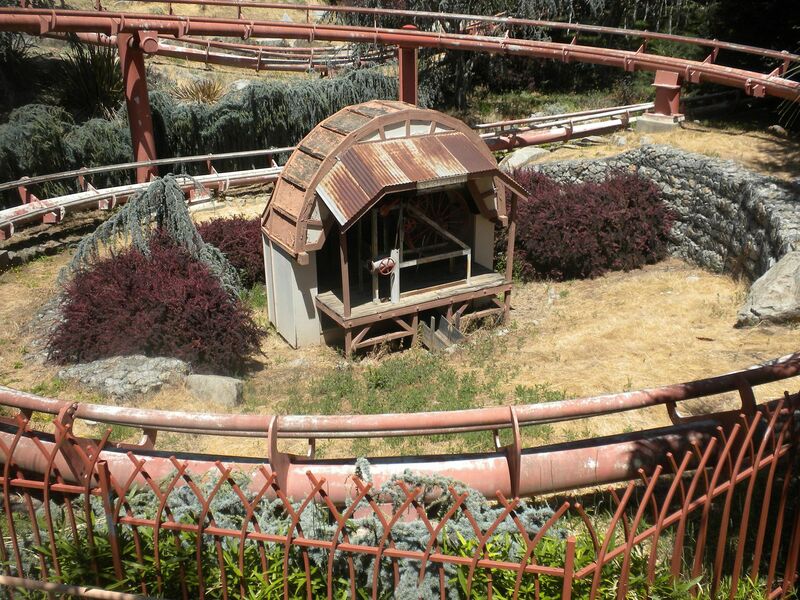 As is the case with all of this park’s rides, it is nicely integrated into the landscape – 2 rides during ERT. 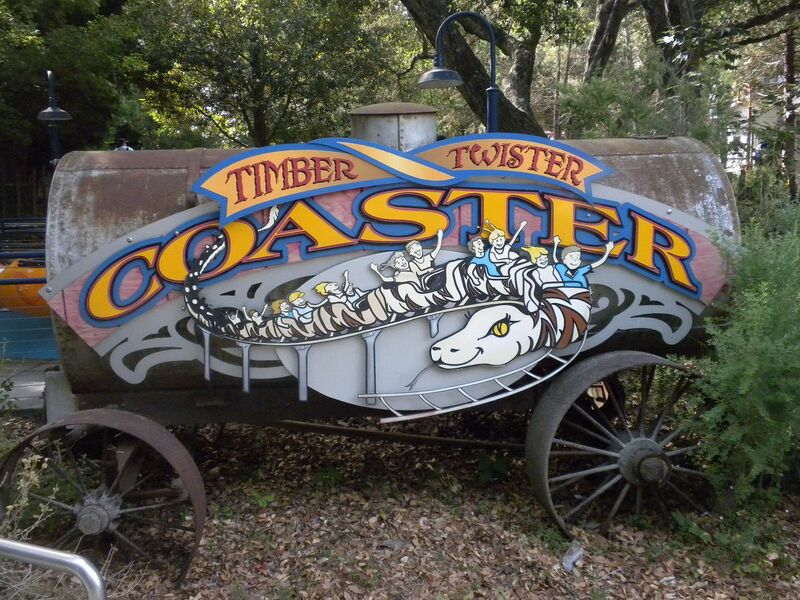 This coaster makes its way among a lot of trees and gives a good ride – 1 ride during ERT. 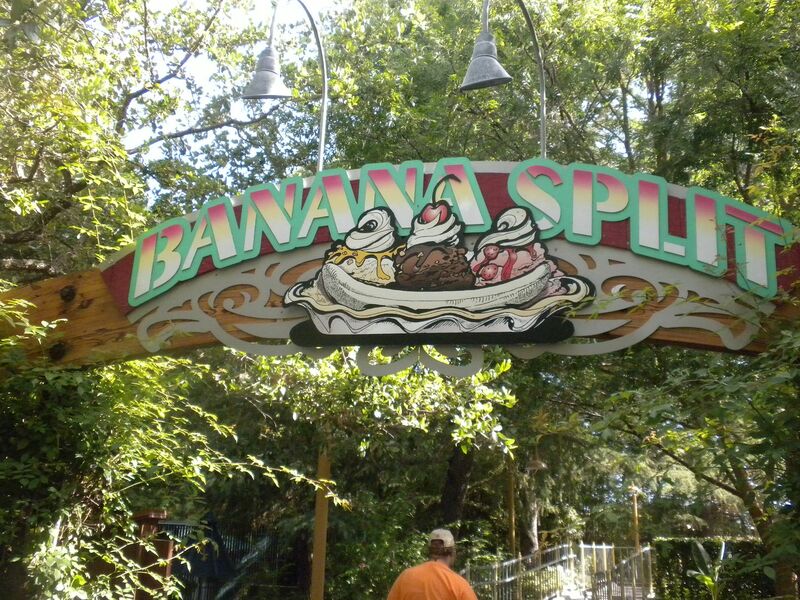 Banana Split: This swinging banana gives pretty good airtime for its size – 2 rides during ERT. 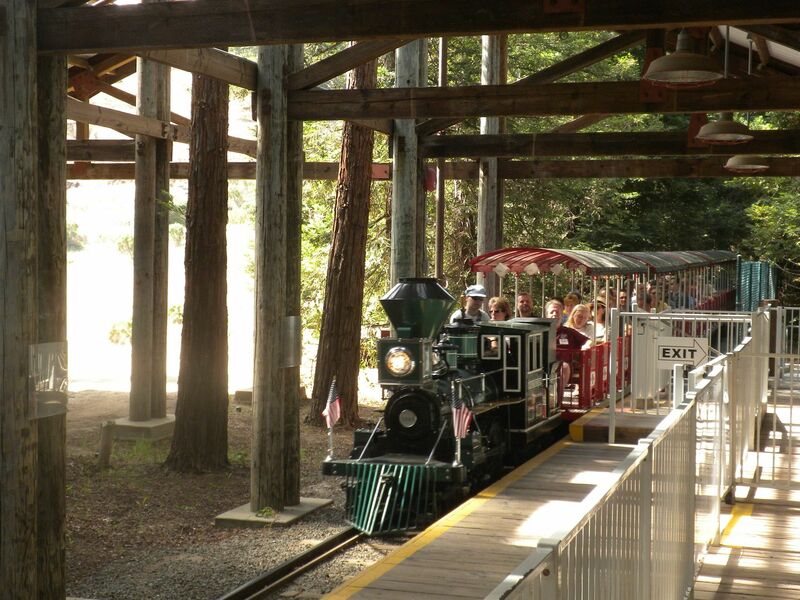 Bonfante Railroad Train Ride: This train encircles the park with stops at Redwood Junction and Coyote Junction. 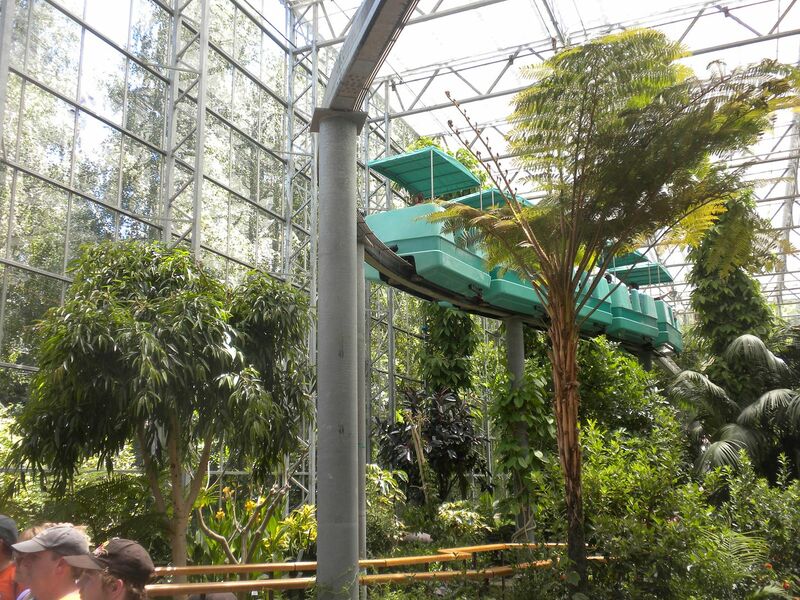 It travels through the greenhouse as well – 2 rides through each station. 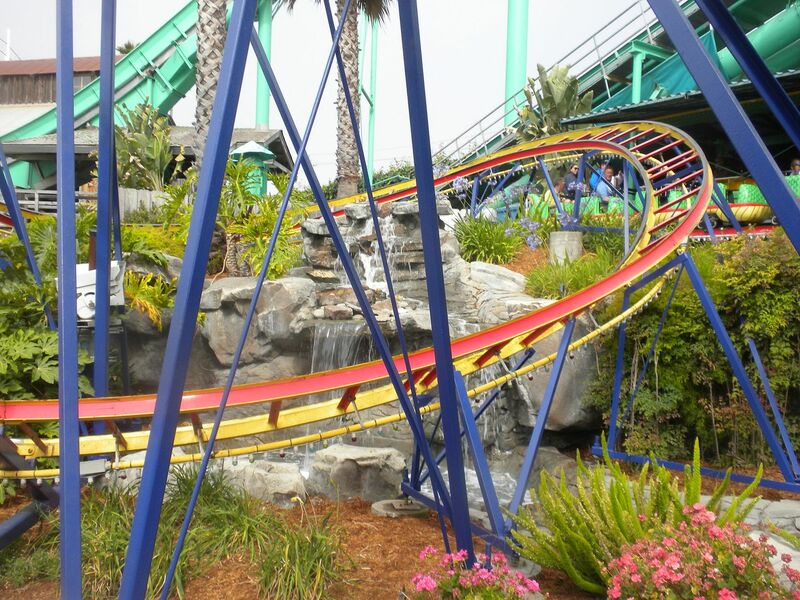 Garlic Twirl: Good spinning on this teacup ride – 1 ride. 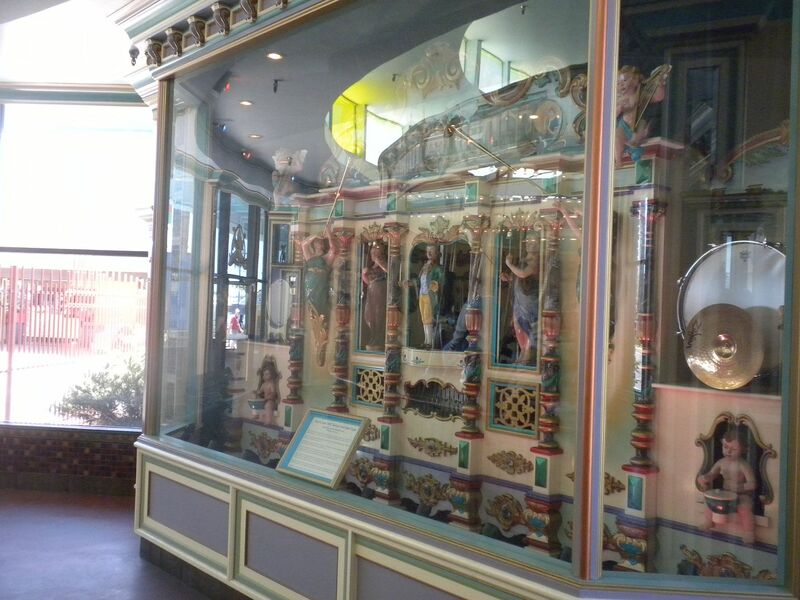 Illions Supreme Carousel: (Illions, Classic Wood Carousel frame with fiberglass authentic reproduction figures; 3 Row: 48 Horses, 2 Chariots; 1927/2001) Although the horses have been replaced with fiberglass models, this classic carousel delivers a great ride – 1 ride in ERT. 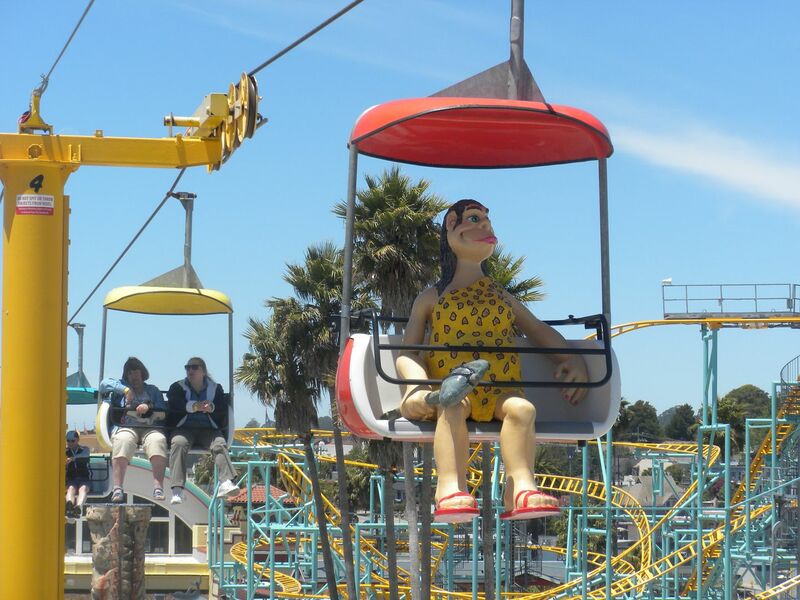 Mushroom Swing: Good swings – 1 ride. 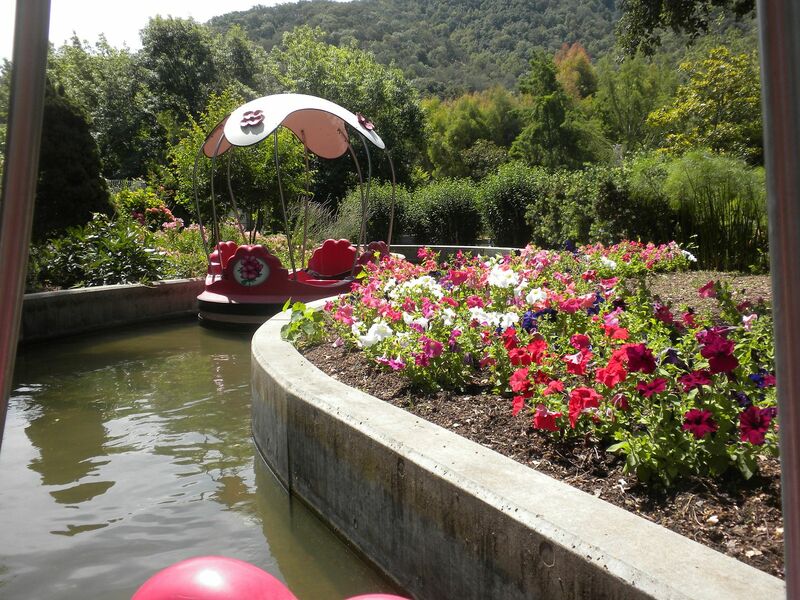 Rainbow Garden Round Boat Ride: These are popular in Europe but rare in the U.S. 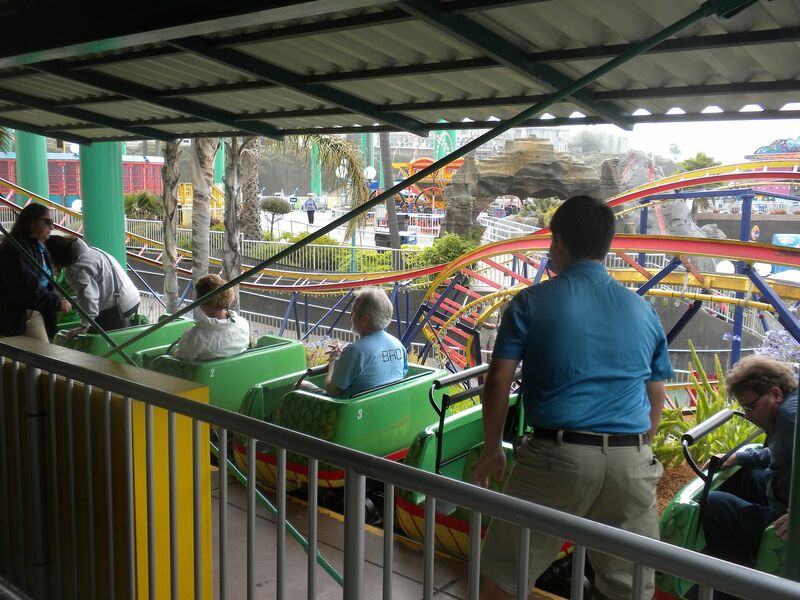 It provides a great view of the beautiful gardens and a relaxing ride – 1 ride. & travels through the greenhouse– 1 ride. 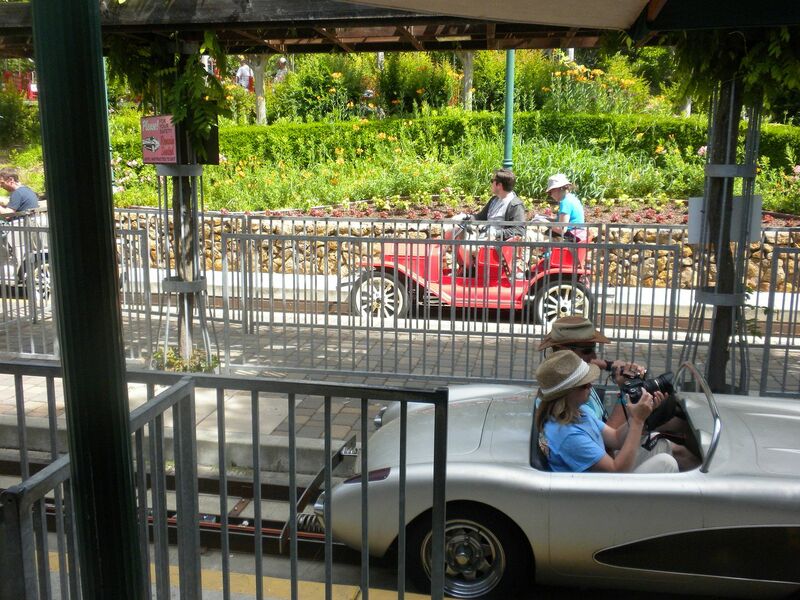 and 1950s sports cars – 2 rides during ERT. 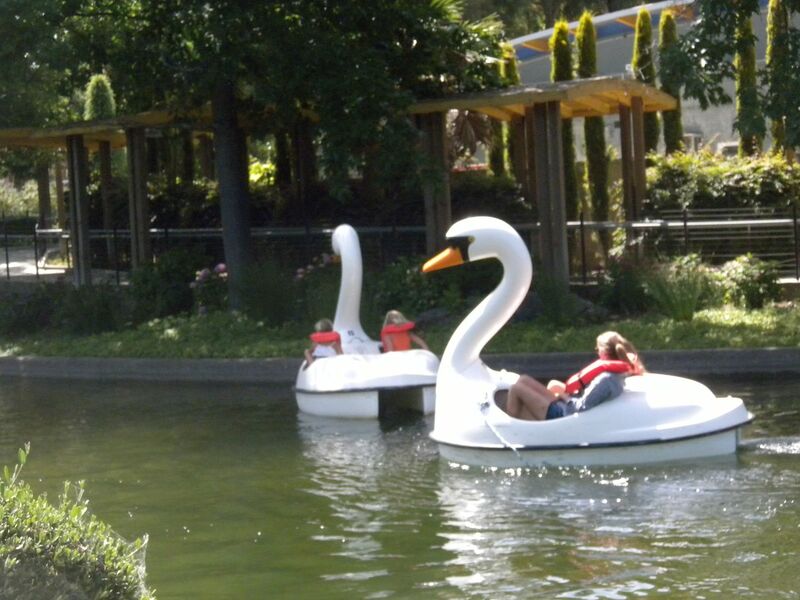 I did not have time to ride the Paddle Boats, boats designed like swans and ducks on Coyote Lake; Panoramic Wheel, a Ferris Wheel; or Artichoke Dip, a small circular ride around a tree. 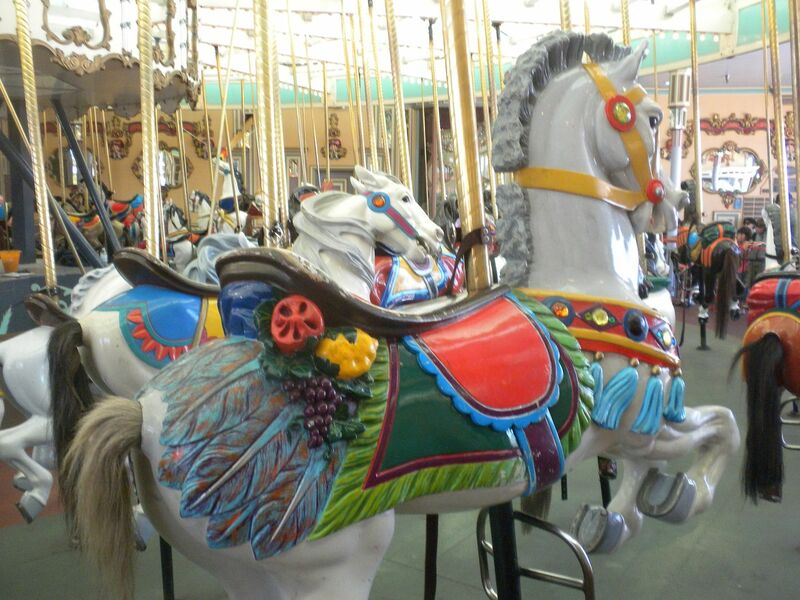 Kiddie Rides include: Apple & Worm; Balloon Flight; Big Red Engine Co.; Bulgy the Goldfish; Claudia’s Carousel (Mangels Kiddie; Classic Metal Carousel; 3 Rows: 20 Jumping Horses, 2 chariots; c. 1940); Pit Stop Racers; Strawberry Sundae; and Tubs-O-Fun. 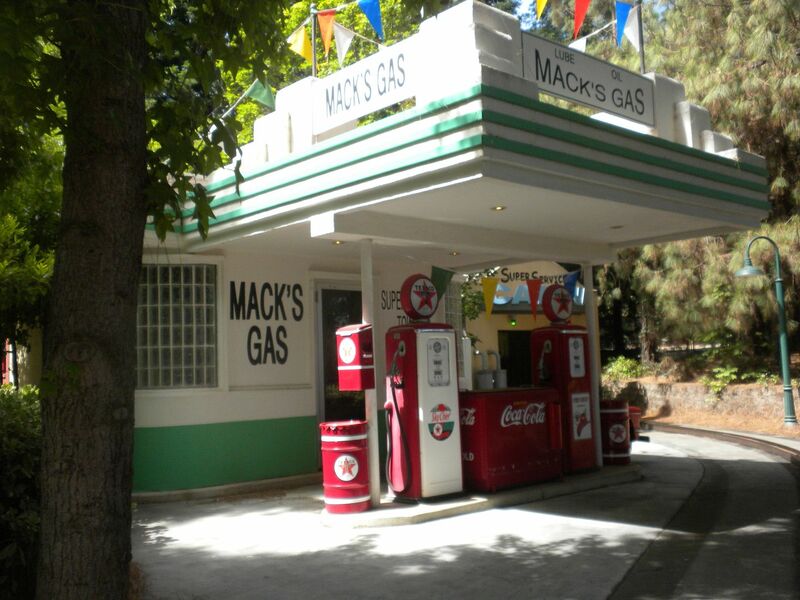 Other attractions include Oak Park Playground and Pinnacles Rock Maze. 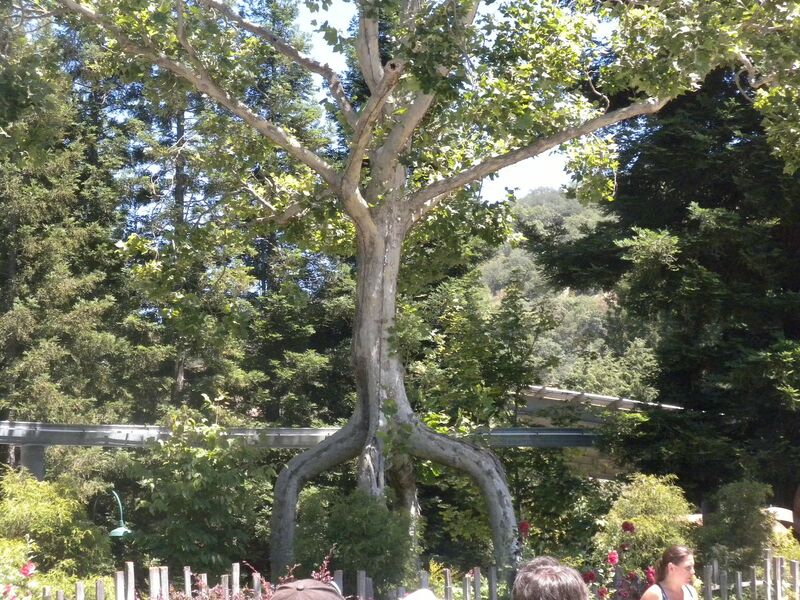 Another significant attraction of this park is the collection of Circus Trees. 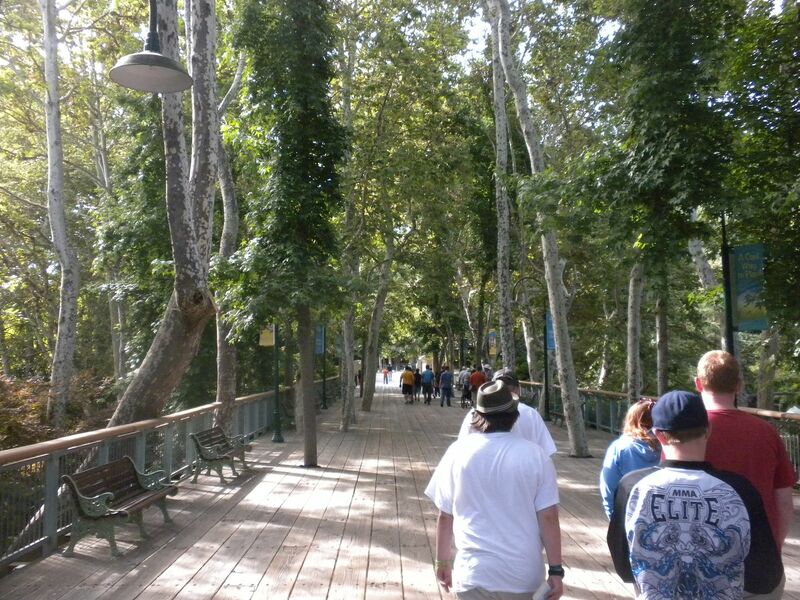 These trees were once known as the “Tree Circus” but had fallen into disrepair. 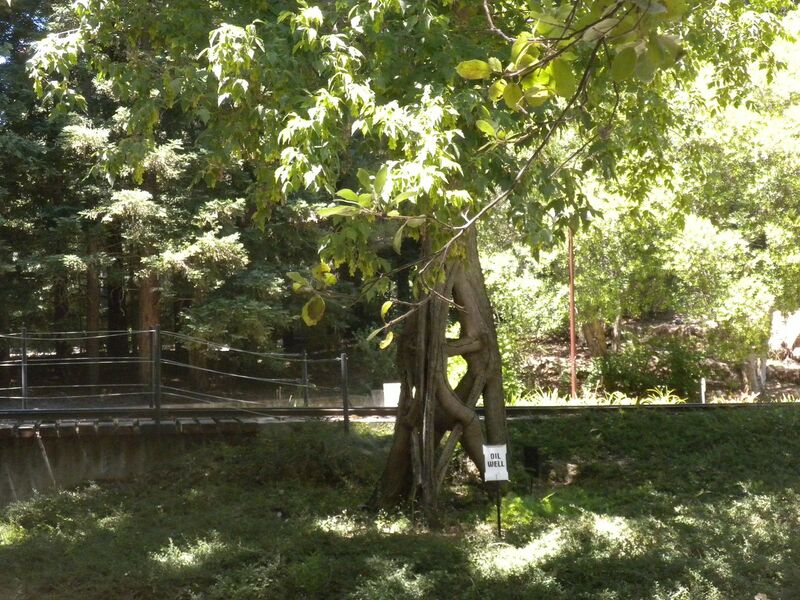 Michael Bonfonte rescued the trees, bringing them to this location in 1984 where they could be properly cared for. We were given a Circus Tree Tour that was very informative. Due to time constraints, we left before the tour was over. 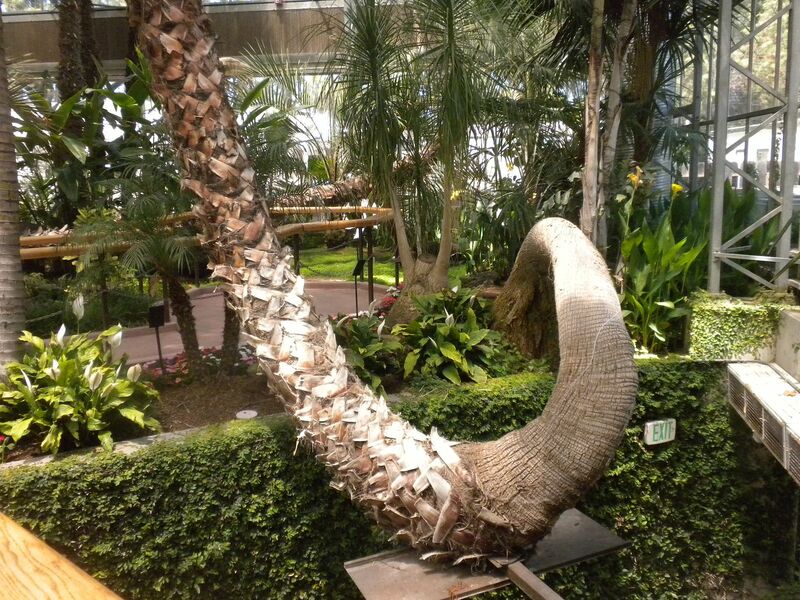 Basket Tree: The centerpiece, made from 6 American Sycamores, is in the Main Plaza. 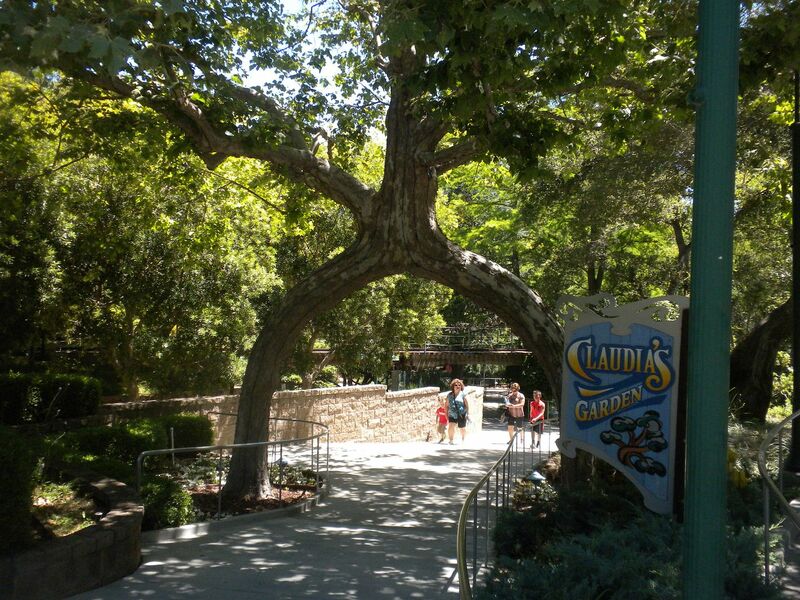 Arch Tree: Created from 2 American Sycamores, it is at the entrance to Claudia’s Garden. Oil Well: Created from 3 Box Elders, it is near the South County Backroads car ride. 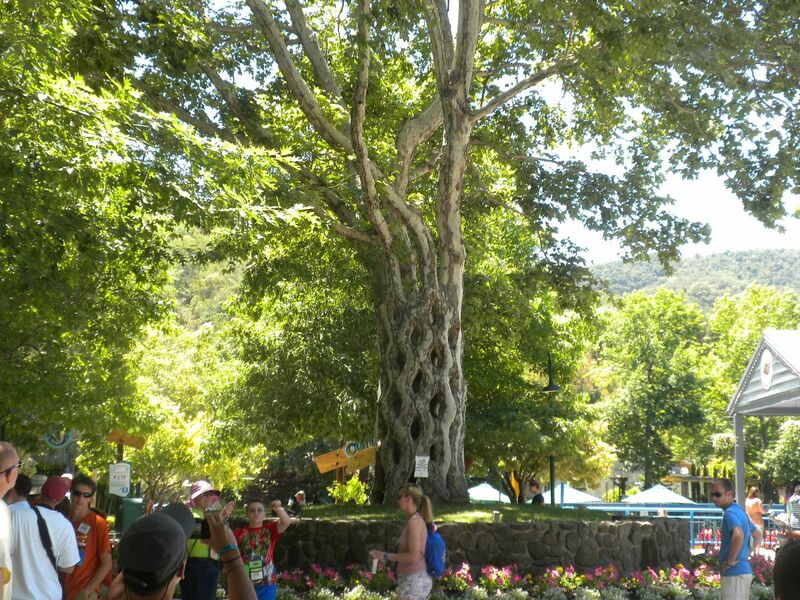 Four-Legged Giant: The first major Circus Tree started in the 1920s, it was made from 4 American Sycamores and was originally in a 6 foot square. It is located in Mission Plaza. We had to pull away but the rest of the trees include: Chain Link, an American Sycamore, at the games area; Compound Eight, a Box Elder, at the front entrance; Double Hearts, which may be a Red Maple, at the front entrance; Emblem, 3 American Sycamores, at Pinnacles Rock Maze; Figure Y, a Cork Oak, at the front entrance; Picture Frame, a Cork Oak, at the front entrance; Revolving Door, a Box Elder, at the front entrance; Short Table, 2 Box Elders, at the front entrance, Sideway Rope Rectangle, a European Ash, at the front entrance; Spiral Staircase #1, 2 Box Elders, at the front entrance; Spiral Staircase #2, 2 European Ash, near Illions Supreme Carousel and Redwood Train Station; Spring Vine, a European Ash, at the front entrance; Squat Curvy Scallops, 3 European Ash, at the front entrance, Zig-Zag, an American Sycamore, near Bonfante’s Splash Garden; Almost Circle Cage, 10 American Sycamores, backstage; Needle & Thread, European Ash, backstage; Flat 3/4 Round Fan, European Ash, backstage; Upright Eight, American Sycamore, backstage; Double Corkscrew, Box Elder, backstage; Birdcage, American Sycamore, backstage; and Double Spectacle, American Sycamore, backstage–1 tour for ACE. The park provided us a good ribs and chicken for lunch. It is a beautiful park and I wish I could have had another hour or two to enjoy its beauty and complete the Tree Tour. 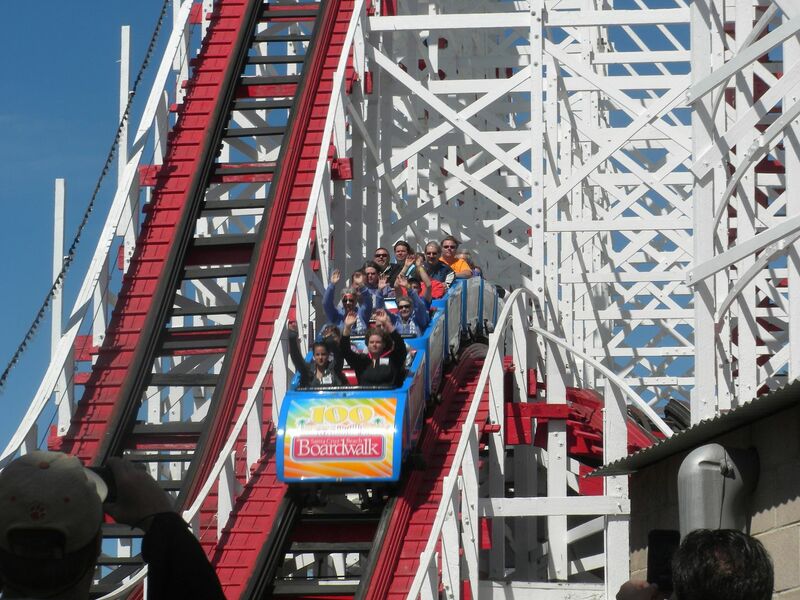 While we were free to enjoy the park all day, several of us were going to a baseball game that evening, plus we wanted to catch another coaster credit. 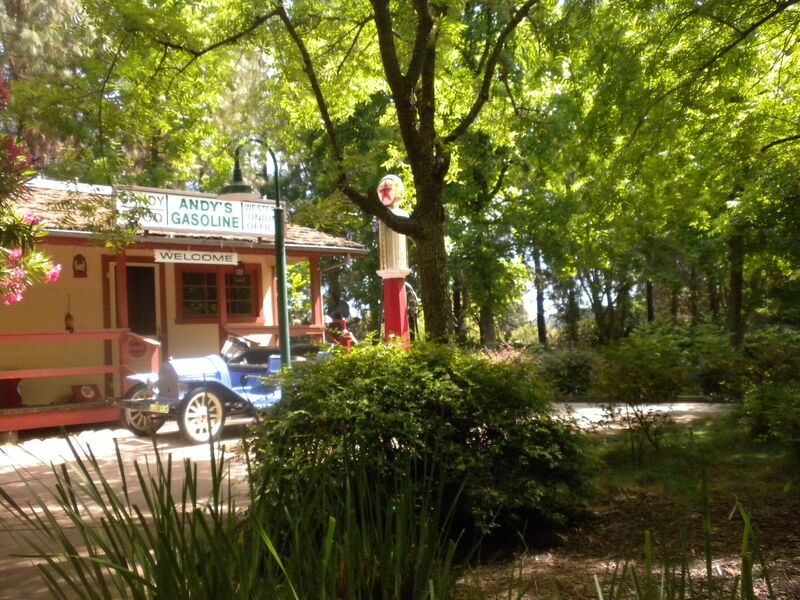 While not a large park, Gilroy Gardens is worth a stop. 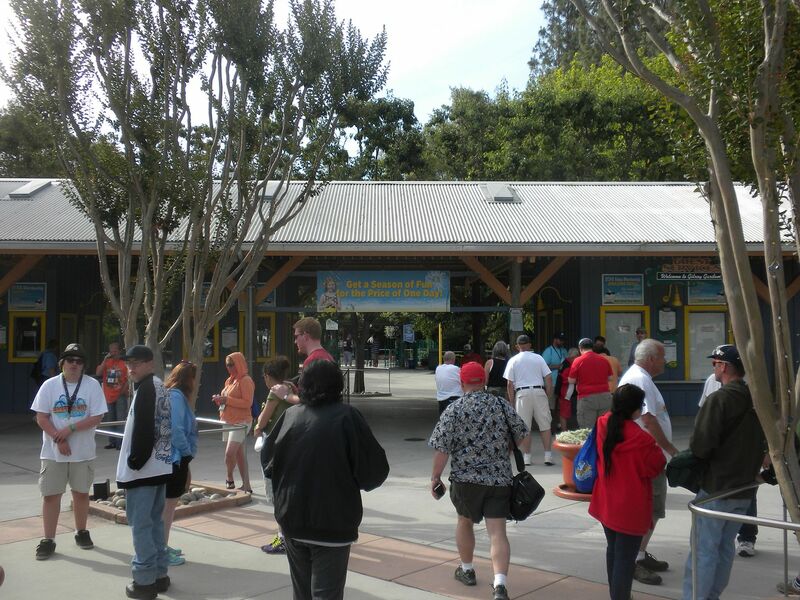 We headed to the Oakland Zoo for a credit, to a ballgame and to more sightseeing Saturday.